Autumn has officially arrived On Sutton Place. and my grapevine trees went in. I’ve had this wreath for a few years. I try to add something new every year. This fall it was the berries. Last fall it was the homespun star garland. The grapevine trees are an eBay purchase. I tried to find some locally but never could. I put ivy in my deck planters in the spring. and put it in the corners of the planters. The ivy grows up the trees and circles around on it’s own. It stays green through Christmas…if I remember to water it! of Autumnal fabric that had blues and greens. I really didn’t want to put away my door mat. I found just the thing. 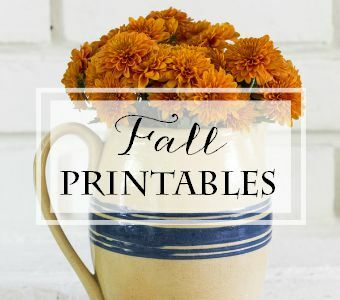 Just click the images below to visit my favorite Fall categories and get inspired! Love the blue door! I have been thinking about painting mine a contrasting color! Thanks for the inspiration! This looks so lovely and very inviting! Great way to get the Fall season rolling! Linking from 2805…..I love the wreath and your urns. I thinks that neat that you add to it every year…. Calling by to visit your blog for the first time as I am also a participant in 2805 Potpourri Friday. 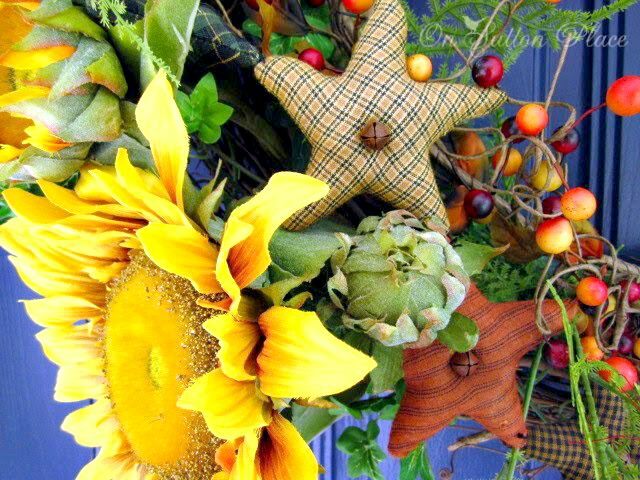 I have enjoyed your post today and like your door wreath, although I am far from ready for Autumn here in Italy. Hi Ann! Just comin' back over to say thank you for linking up your beautiful porch at our Inspiration Friday party this week! Oh Ann, what a big beautiful wreath! And it really pops against your pretty blue door! Happy fall! Ann, I'm so happy you linked up this beautiful wreath! 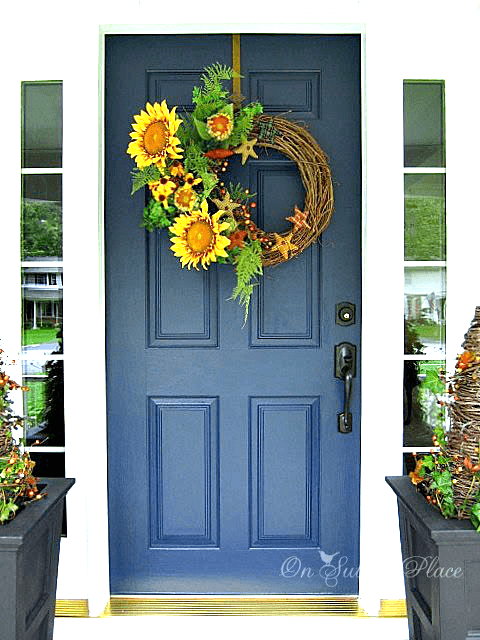 It looks so good on your blue door! Thanks for linking to Potpourri Friday. Your participation made for a more successful party. I appreciate you! So welcoming! I love the wreath on your door, it is gorgeous. I love all the little details you added. Definitely magazine worthy!!! This is stunning Ann! I just LOVE that wreath! The sunflowers are SO perfect this time of year! Ann, your front door is beautifully decorated for Fall. Your grapevine trees are so gorgeous. I have never seen them before. I love your wreath. The stars are soooo cute!! 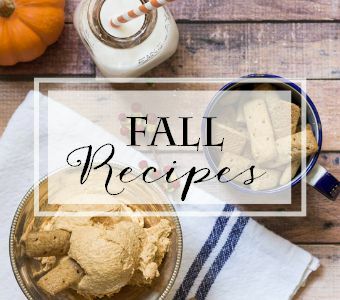 Visiting from Savvy Southern Style link party. Very pretty! I love the trees and ivy in the urns. I love it! 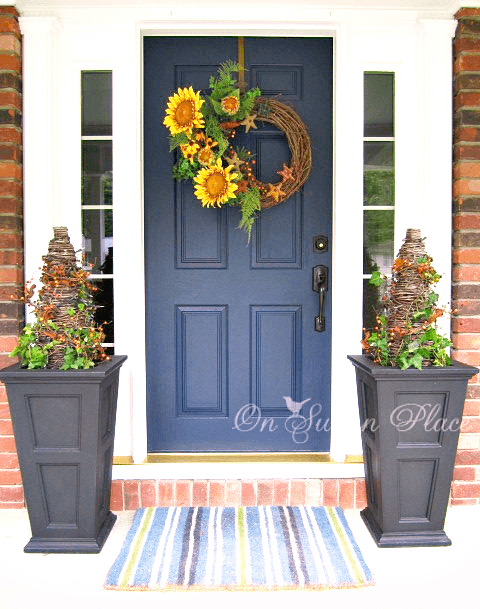 Gorgeous wreath and pots! I LOVE your wreath and look at the little puffy stars! This is just wonderful. You did a fantastic job. 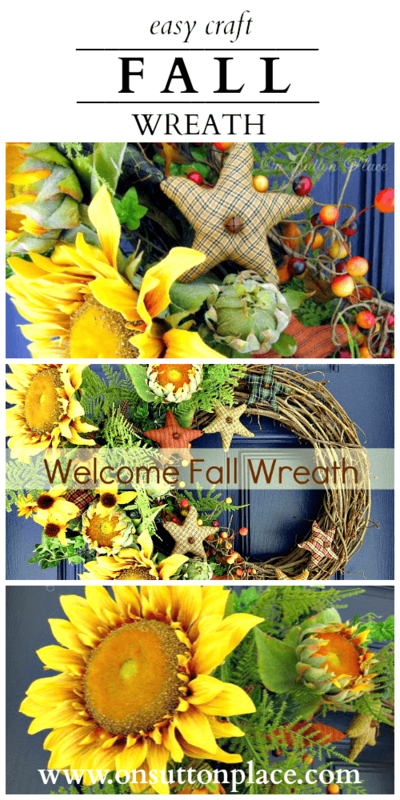 The colors in your fall wreath look stunning against your front door color. Aren't you glad you painted it that color? Can't wait to see what kind of rug you found. I just love your big ol' pop of autumn on your front door! Your porch looks as clean and crisp as a whistle! The next move will not be permanent but we'll be there 5 years for residency. That's my next post. Dread moving again but it's part of the journey. Hope you are having a great school year so far! Wll, Fall has arrived at Sutton Place. What a great wreath! 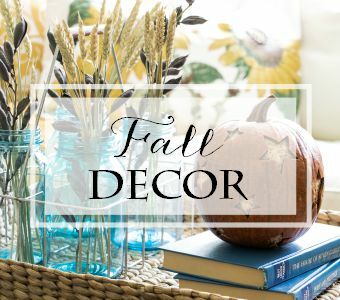 I'll be looking forward to the rest of your Fall decor! I hope you will bring one of your projects or posts to my Potpourri Friday Party this week. Link-up starts on Thursday afternoon. Without a doubt, your participation will help make the party better! I love the fabric stars. This looks so beautiful Ann! It's very welcoming. I love the grapevine trees. I'm amazed that the ivy lasts the winter. I love your wreath, but I think the gold against your pretty blue door is what makes it so stunning! 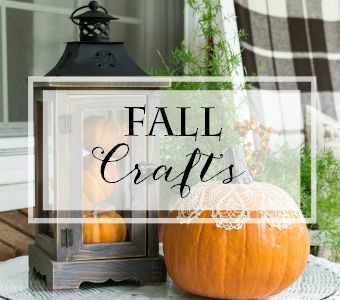 I'm just now beginning to buy my craft supplies for fall, so I'll soon be having some new things too. I'm in the fall mood now, but between the last 3 days of rain and still having hot weather, it doesn't feel quite time for fall yet. We'll get there in a few weeks. I love the grape vine trees and your gorgeous fall wreathe, it is wonderful! Everything is looking very fall-ish at your house. fall is most defintaly in the air at Sutton Place. Richard from My Old Historic house. Your grapevine topiaries are great. Love the berries and ivy. We have tons of wild muscadine vines I keep saying I'm going to use for something. I really love everything you're doing with your home and blog. You go girl! Wow, Ann. Beautiful. Happy Fall! Ann, Your entry looks beautiful. Vary fall. I love the trees. Here's my address! Oh wait – it is probably too far for you to come and get me started…but honestly 114 degrees is just too hot to decorate in….I will get there eventually. I LOVE your wreath! So neat! Love the idea with the grapevine tree, I have one that I bought years ago from The Gooseberry Patch and it wasn't cheap so I've never sold it at the yardsales. I have one big planter so I might give this a try! I love your wreath and how you add to it every year! I'm in love with those large scale planters of yours, Ann, and grapevine trees are so perfect for fall. 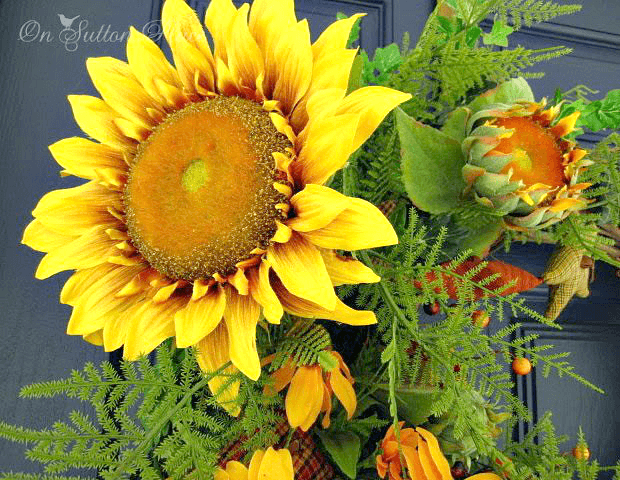 Plus, I can't resist sunflowers… I think I'll plant some next year! All looks blessing and crispy fall feel. Love it. Ann, I love those huge sunflowers! Actually love it all, so welcoming! Absolutely lovely Ann. I love the look of your front door. Now, if it stops raining, I hope to get mine redone this week, but off to work I go today! No decorating! Ann, I love your wreath and those grapevine trees. I think they sell those here at Hobby Lobby. I have not begun to decorate for fall yet. Love getting inspired by others though. I love that you add something new to that wreath each year. That's brilliant – you get to have a tried and true combined with fresh and new. (that was kinda poetic, wasn't it). Anyway,..your entry looks great. Your entryway looks so inviting and festive Ann, perfect! I put mums in urns for our front porch, over the weekend and did a small fall arrangement. Loving the cooler temps. looks lovely and i love the color of that door!